Investments A merger, not a takeover, say partners. 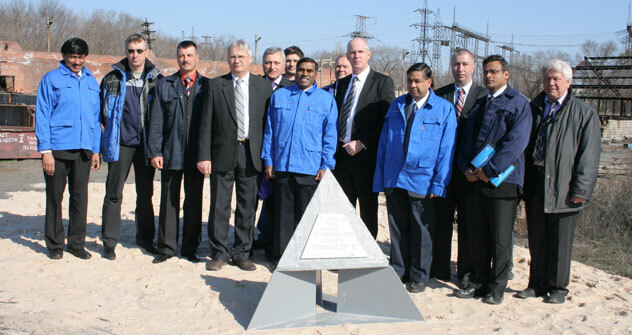 The Volzhsky Abrasive Plant, in which CUMI International Ltd, an Indian company, owns a controlling stake, launched a new facility for the production of silicon carbide in April. With an annual output of 75,000 tonnes of this raw material, the plant is the largest such facility in Europe and the only one in Russia. The first stage will cost $6.6 million and is due to go into operation in 2012. Subsequently, three more such modules are to be built. Silicon carbide is a diamond-like material with manageable nano-structure-dependent properties. It is used in various industries ranging from metallurgy to electronics. It is widely used for producing high quality refractory materials, technical ceramics, special elements for electronics and filters. In the future, the project envisages deep processing of silicon carbide. The plant’s managers and Indian owners see no problems with silicon carbide sales: there are already orders for the next few years. Officials at the plant are proud that it supplies its products to every country in Europe and will soon be a household name across the world. Another promising area of growth at the plant is alternative energy. A special silicon carbide fraction produced in Volzhsky is processed in India into micro powders to be used in elements of solar cell banks. The challenge now is to organise supplies of similar products to Russian markets. CUMI International LTD, part of Chennai-headquartered Muragappa Group, bought a controlling stake in the Volzhsky Abrasive Plant in September 2007. The deal was not struck instantly: Indian executives visited the Volgograd region three times, met the top management and studied the technology used at the plant. Volgograd managers, for their part, also came to India to discuss the guidelines for future cooperation. The case for going ahead with the deal was obvious. CUMI, whose core business is the production of grinding materials and abrasive tools, owns 25 plants similar to the Volzhsky in Europe and Asia. "The Volzhsky Abrasive Plant is our group’s biggest unit. It is the biggest producer of silicon carbide and uses world-class technology for the production of abrasive materials and grinding tools. It has a highly professional workforce, beginning with workers and ending with the executives." CUMI, however, found a superb asset in the Russian market; the company was buying a successful enterprise. The Volzhsky Abrasive Plant continues to control half of the Russian market of ceramic abrasive tools and supplies its goods to 40 countries. Therefore, the Russian and Indian partners agreed that this was not a takeover but a merger of the two successful businesses. Four years of close cooperation have proved that such integration bears fruit. The output of silicon carbide went up by 15%. The production of abrasive instruments rose by 25%. In November 2009, the plant launched the first facility in Russia for the production of fireproof nitrite-bonded slabs worth 3 million euros. The slabs are intended for the aluminium, porcelain and defence industries, including those for internal lining of nuclear submarine reactors. The Indian investors have substantially renovated and restored the production and technical facilities of the plant, which marks its 50th anniversary this year. Both sides place high premium on technology exchanges. Based on the recommendation of the Indian experts, the smelting furnaces’ design and the organic-bonded abrasive formulas have been improved. The Russian specialists, for their part, shared their know-how for ceramic-bonded tools production. The Indian owners did not doubt for a minute that they needed to preserve the plant’s social commitments. After CUMI International Ltd. bought into the enterprise, all the social benefits for the plant’s workers were kept intact. What’s more, the company recently invested 20 million roubles in renovating Kristal, the corporate health and recreation centre where the plant’s workers not only vacation but also go to recuperate. A third player in this effective partnership is the administration of the Volgograd region. “The agreement we signed with the regional authorities envisages investment tax breaks, support during complicated negotiations with natural monopolies and much needed assistance in finding top-of-the-line workers and engineering personnel,” says the plant’s Director General Director Sergei Kostrov. JSC Volzhsky Abrasive Plant is the only producer of silicon carbide in Russia, the biggest producer in Europe and the biggest producer of ceramic-bonded abrasive tools in Russia and the CIS. The plant is commemorating its 50th anniversary this year. Designed in the former USSR, the construction site was chosen because of a large raw materials base: quartz sand was mined in the Orlovsky Quarry on the right bank of the Volga River, the petro-coke came from the Volgograd Oil Refinery and the electricity supply was provided by the nearby Volga Hydroelectric power station. The first production line was launched in 1961. The first batches of abrasive grain were supplied to the international market in 1962. CUMI International Ltd. has an annual turnover of over $300 million. It invested over $150 million in production development over the past five years.